Making bread is relatively easy. Mix some flour, yeast, some sugar, a pinch of salt, water, and voilà, all you have to do is bake the dough after it rises. Sourdough bread is different. Sourdough doesn't use ordinary yeast. 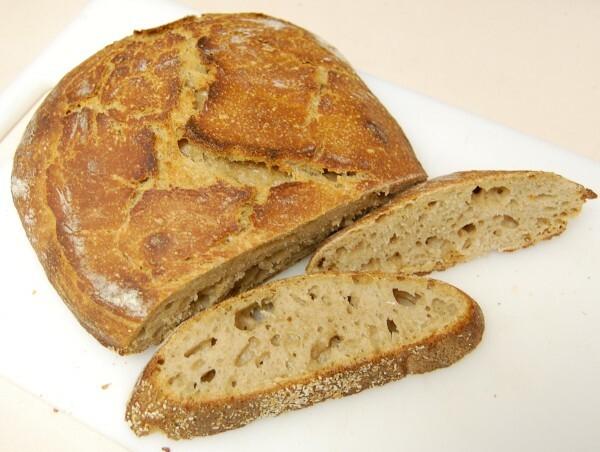 It uses a "sourdough starter" which is a brew of wild yeasts and acid-producing bacteria. These yeasts and bacteria are very particular. You have to coax them to come out of hiding by providing the right conditions for them to multiply and to prevent competing bacteria from gaining a foothold. I had failed several times at making a sourdough starter by mixing flour and water. I typically ended with containers of stinking gruel which had to be discarded. Recently, through an e-mail exchange about carbohydrate chemistry, I found out that Debbie Wink had systematically studied the conditions best suited for creating a sourdough starter. It turns out that acidifying the initial culture suppresses undesirable bacteria and gives the good yeasts a chance to get started. Debbie's solution was simple and elegant: use unsweetened pinapple juice instead of water for the first three days of incubation. The pineapple juice provides the right amount of acidity for the sourdough yeasts and bacteria to thrive. Recently, I made my first loaf of sourdough bread. It is the accomplishment of an elusive goal.